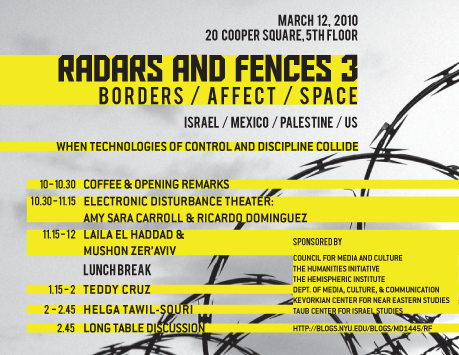 On Friday March 12th 2010 I will be participating at NYU’s Media Culture & Communications’ Radars & Fences III: Borders, Affect, Space (please RSVP and come). My friend Laila El-Haddad and I will present You Are Not Here – A Tour of Gaza Through the Streets of Tel Aviv, and we’ll discuss the way geography and the concept of the border is shaping the mediated experience of the conflict. We will also discuss some of our recent initiatives to disrupt the theater of conflict resolution. I am posting an essay Laila and I wrote for the catalog of the Unrecorded exhibition in Istanbul, March 2008, curated by Basak Senova. At the end of the essay I embedded the videos of Laila & Saeed’s Al Jazeera documentary Tunnel Trade that have inspired this text. When Israel withdrew from the Sinai Peninsula in 1982, the city of Rafah was suddenly split between Egypt and Gaza by an Israeli wall. Families found themselves divided by a high-security international border, though their houses often lay less than 100m apart. 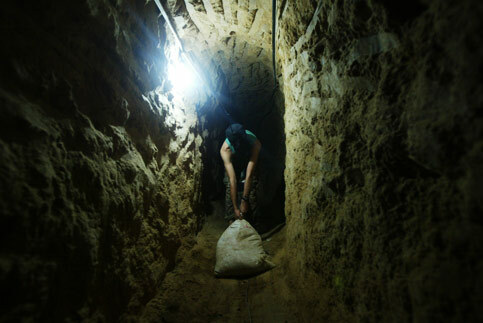 Before long, influential families who once controlled trade through Rafah moved their business underground through dozens of secret tunnels burrowed below the border, connecting family houses on either side.